The cultural Association of Azogires is inviting you to see and be a part of the sacred 3 day celebrations of the 99 Holy fathers , and St, John the Hermit in Azogires - . Sunday 6 October evening ceremonial mass at the Monastery of the 99 Holy Fathers ,where you can also view the museum of the monastery. After the ceremony there will be a traditional festival in the centre of the village. 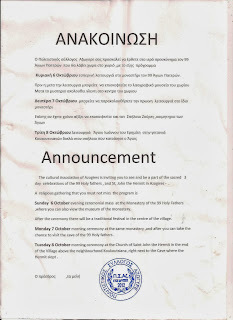 Monday 7 October morning ceremony at the same monastery ,and after you can take the chance to visit the cave of the 99 Holy fathers . 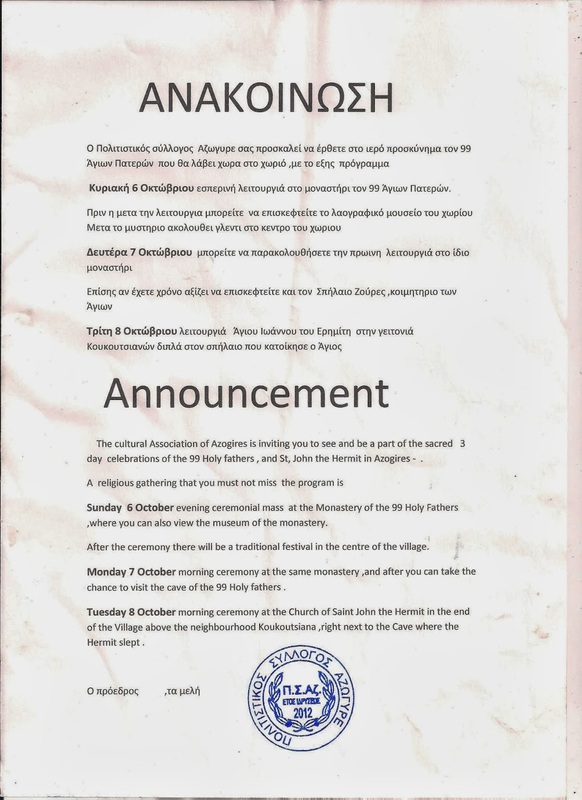 Tuesday 8 October morning ceremony at the Church of Saint John the Hermit in the end of the Village above the neighbourhood Koukoutsiana ,right next to the Cave where the Hermit slept .